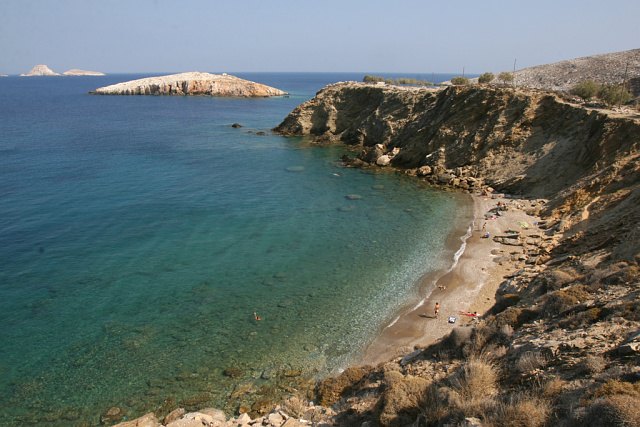 The third beach in a raw (Latinaki – Vitsentzou – Pountaki) and closer to Livadi is Pountaki. With a view to the islet of Ai Giannis and the little church on top, nearby Sikinos, and several rocky islets. Pountaki gives towards the East to the open sea. Blue waters, sandy beach and cliffs delimit it. You pass by the path to Vitsentzou and after 300 metres (there is a sign) you take the one down to Pountaki. It is short but steep and you should be cautious.